SOON TO BE A MAJOR MOTION PICTURE • Two women in 1920s New York discover how fluid—and dangerous—our perceptions of race can be in this electrifying classic of the Harlem Renaissance. Irene Redfield is living an affluent, enviable life with her husband and children in the thriving African American enclave of Harlem in the 1920s. That is, until she runs into her childhood friend, Clare Kendry. Since they last saw each other, Clare, who is similarly light-skinned, has been “passing” for a white woman, married to a racist man who does not know about his wife’s real identity, which she has chosen to hide from the rest of the world. Irene is both fascinated and repulsed by Clare’s dangerous secret, and in turn, Clare yearns for Irene’s sense of ease and security with her Black identity and community, which Clare gave up in pursuit of a more advantageous life, and which she can never embrace again. As the two women grow close, Clare begins to insert herself and her deception into every part of Irene’s stable existence, and their complex reunion sets off a chain of events that dynamically alters both women forever. 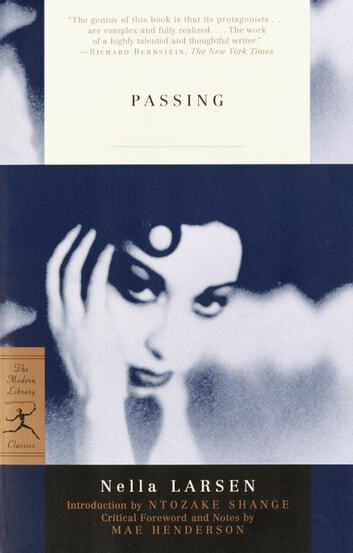 In this psychologically gripping and chilling novel, Nella Larsen explores the blurriness of race, sacrifice, alienation, and desire that defined her own experience as a woman of mixed race, issues that still powerfully resonate today. Ultimately, Larsen forces us to consider whether we can ever truly choose who we are.